The completion of Africa’s largest carport photovoltaic system, the 858 kilowatts peak (kWp) plant built on a storey of a car park in a mall in Kenya's Nairobi, is a testimony to country’s potential in harnessing renewable energy. The plant is owned by a private investor andthe energy produced can be used for supply, environment conservation and generation of thousands of jobs—both directly and indirectly. Estimates from 2012 indicate that wood fuel and other biomass accounts for 68 per cent of the total energy consumption whereas petroleum accounts for 22 per cent and electricity for nine per cent. Other sources like biogas and solar account for the remaining one per cent. According to the World Bank, Kenya’s per capita carbon emission was 0.31 metric tons per capita in 2011. Hit by the impact of climate change, Kenya is steadily embracing diverse sources of renewable energy. The country has gradually resorted to adoption of practical technologies in harnessing renewable energy to enhances its energy supply and curb carbon dioxide emissions. As a result of the country’s recognition of the potential alternative energy sources, Kenya has witnessed an unprecedented growth in macro and micro renewable energy programmes. The green initiatives are spawning a green economy that is improving livelihoods, particularly in rural areas. The developments have made the renewable energy sector the most vibrant in Africa. 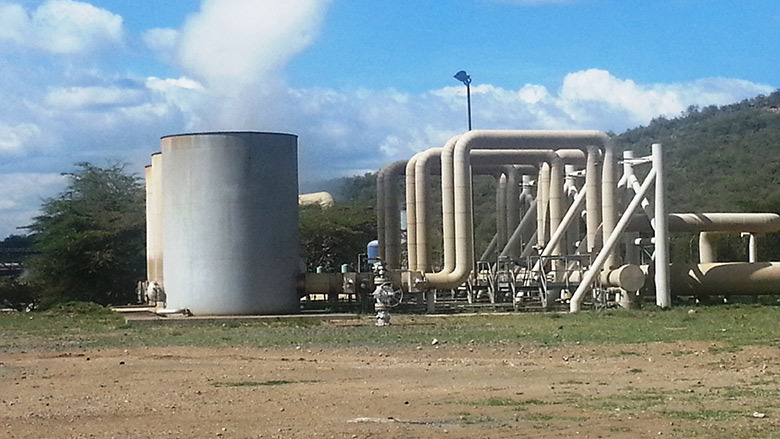 Kenya now boasts of mega renewable energy projects like the world’s largest single turbine geothermal power plant that was launched in 2014. The project, located at Olkaria near Lake Naivasha, will add 140 megawatts (MW) to the country’s national electricity grid. It will expectedly cost US $126 million to reduce the cost of energy in Kenya by 50 per cent. Besides the large scale projects, there has been a sharp rise in micro renewable energy solutions adopted in rural areas that house 70 per cent of country’s population. For instance, briquettes from biomass, solar lanterns, and improved wood/charcoal cook stoves and biogas digesters in rural areas and urban slum areas, are all booming. Benefits to end users include affordability, clean, reliable and accessible sources of energy, with no negative health impact on people. In fact, every village in Kenya has at least a household that is using one renewable energy gadget. But it is not just the end users who are the beneficiaries of the growing renewable energy sector. The growth has also helped local innovators and entrepreneurs through the value chain. A good example of this is the booming business of briquettes that are a low cost alternative to using firewood, charcoal or kerosene. They use recycled biomass, hence reducing deforestation and generate livelihood as thousands of entrepreneurs – mostly women in urban centres and rural areas – are involved in manufacturing of briquettes. Workshops for making and selling improvedbriquette stoves have also sprung up. Rural areas have also witnessed a boom in manufacturing and retailing of solar lanterns, biogas derived from animal dung, and solar cookits. In urban areas, including slums, communal biogas plants from human waste, rooftop solar panels/heaters and wind turbines are now common. The Kenyan government has also set up a network of centres whose officials have noted that there is an increased uptake of renewable energy technologies and related information. Meanwhile, micro finance institutions have helped with affordable loans and credits. For instance, M-KOPA Solar, an asset financing company that sells small-scale solar home systems to off-grid households on an affordable, 12-month mobile money payment plan via hire purchase, has been adopted by hundreds of households. With over 90 per cent of Kenya’s population of 42 million relying on fossil fuels and wood/ charcoal, the government is keen to support use of renewable energy. This is being undertaken by upgrading and expanding energy infrastructure like pitting up wind power plants, promoting energy efficiency and conservation mobilising, and ensuring diversification of energy, among others. The government has also initiated training and technology transfer to build local capacities of locals. Through the support of the World Bank Group, the national government has established a climate innovation centre to ensure the success of new projects. County governments, on the other hand, are lighting up rural markets by using solar energy and hence increasing hours of conducting business activities. The Kenya Climate Innovation Center (CIC) offers financing and other services to a growing network of climate innovators and entrepreneurs. The centre supports many sustainable climate technology ventures and is expected to generate about 28,000 jobs, both directly and indirectly within 10 years. Donors working with non-governmental organisations and community-based groups have also contributed to the growth. SNV Netherlands Development Organisation and Hivos are two international organisations that are busy seeking solutions to persistent global issue. They have also established biogas projects in rural areas of four regions of Kenya. The programme targets launching 8,000 domestic biogas plants. Besides, many others are involved in retail of renewable energy gadgets—both imported and locally manufactured. They include solar and biogas energy equipment as well as sophisticated briquette making machines. There are no concrete figures to indicate the volume of imported products as compared to the domestic ones but observers in the industry indicate that due to lower investment in research and development in the renewable energy sector, imported products outstrip locally made ones. Large quantities of solar panels, for instance, are imported from China. But local artisans are also heavily involved in making improved equipment. Others are promoting novel ideas such as working with communities to ensure adoption of Community Power Centres (CPCs), also called “energy kiosks” that are decentralised electrical energy service centres, powered by renewable energy technologies. The centres are designed to be financially sustainable by generating income to cater for their operations, and even make a profit. Presently, 10 such centres exist in the country. They offer services like lamp recharge, information and communication technology, small industrial applications, community recreation centres, recharging of LED lamps and phones. It is projected that if the overall renewable energy production continues to grow consistently, it could make up to 60 per cent of national energy supply by 2030. Between 2014 and 2024 alone, a 30 per cent increase is likely to occur. In 2015, the government drafted a Green Economy Strategy and Implementation Plan (GESIP) to support national development goals for rapid economic growth. It binds the government to introduce a regulatory framework for wood fuel and promote commercialisation of renewable energy. The drafters of GESIP, however, state that despite the growth of the renewable energy sector, Kenya is facing challenges in achieving a strong green economy. One of the challenges is that the economic policy framework in the country incorporates use of fiscal policy instruments such as environmental taxes, subsidies, pollution charges, public expenditure on green infrastructure. Also, inadequacy of information about green technologies, technology transfer and adoption and adaptation of technologies as well as access to financing is wanting.